In last week's post I talked about Bologna, piadina, and how my first year living in Italy expanded my culinary horizons -- what I didn't talk about, but which definitely deserves a mention, is the cooking course that I took in the Spring of 2010, with an excellent teacher named Rita Mattioli. The course focused on Italian food and covered a variety of topics, from antipasti to fish to fresh pasta to desserts. Not surprisingly, it was right up my alley, and I remember practically skipped down Via San Vitale every week to get to Rita's apartment for class. 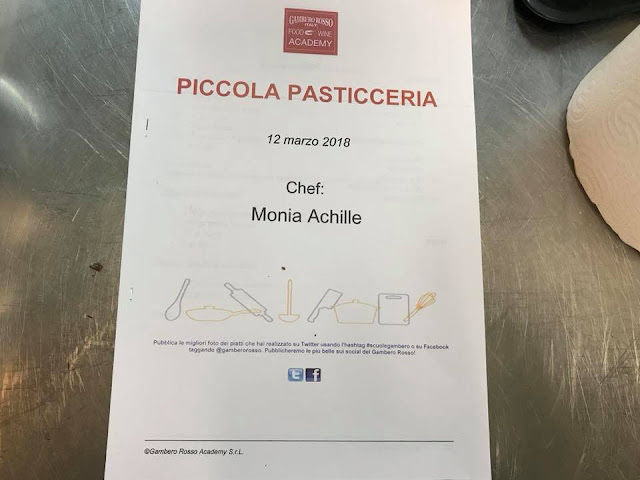 During the course I learned how to make fresh pasta dough, shape tortellini, clean and roast a whole fish, and make an authentic ragu' alla bolognese, among many other skills. My cooking class with Rita was the source of some of my nicest memories the whole year, and even now, 8 years later, I still look back on it with great nostalgia. After my course with Rita however, I didn't take any more cooking classes -- I returned to the U.S, moved to Rome a year later, and was suddenly working full-time, even teaching a few of my own (American) cooking classes to the high school students I taught English to that year. I went on to work for a University that paid me very little, and spending any extra money on a class didn't seem wise; I eventually started up this blog, where I was cooking and recipe testing non-stop, and doing additional cooking didn't seem necessary. For one reason or another, my cooking course kick went by the wayside. Until recently, that is -- I may have mentioned my frolleagues (friend-colleagues) in my old division on here before. When I was sadly transferred to a new division, one of their parting gifts was a cooking class of my choice at Gambero Rosso, a super cool association here in Italy that, in addition to offering cooking classes at its headquarters in Rome, also has its own magazine, TV channel, guide books, and food-related degree programs. Gift certificate in hand, I ended my cooking-class drought and signed up for a class on piccola pasticceria (roughly translated, little pastries) which are popular here in Italian bakeries (a tray of these makes the perfect contribution to a dinner party you've been invited to when you haven't had time to cook, in my experience. See also: Prosecco). The class promised to cover more European desserts I wasn't so familiar with, things like eclairs, pastry cream, and sablé (I'll get to that last one in a minute). 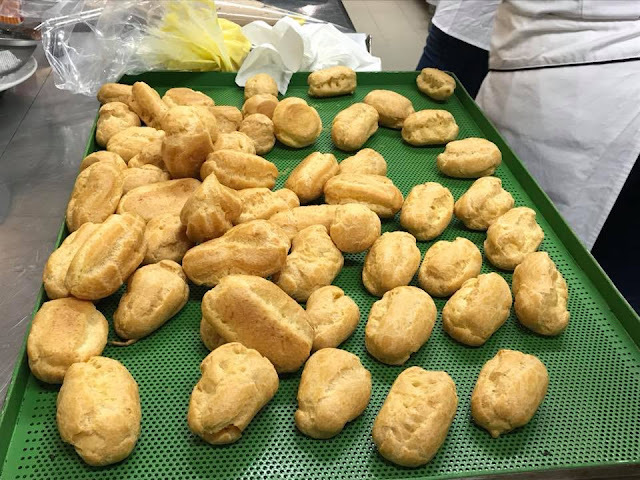 My confirmation email told me that the piccola pasticceria class would last three hours, from 7-10pm, and be held in one of the (dreamy, professional -- my words, not theirs) Gambero Rosso kitchens at headquarters. 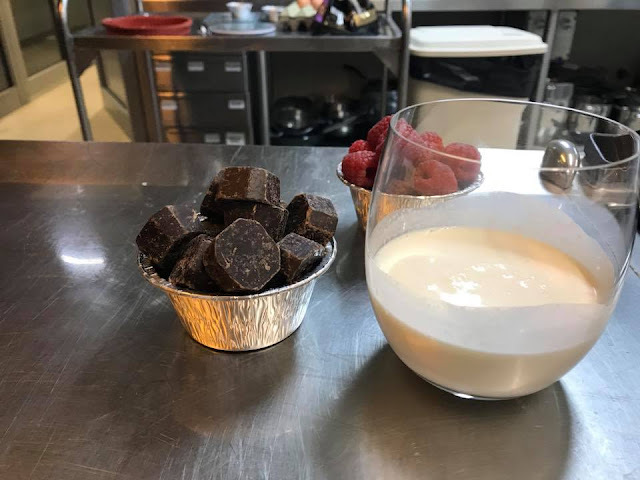 When I arrived, I was partnered up with Benedetta (all students work in pairs) and we were introduced to our instructor, the very knowledgeable, very authoritative pastry chef Monia Achille. I was a little nervous at first -- too many years of baking by myself in my own kitchen? !-- but I needn't have worried, as the whole class was so much fun. It was in some ways unlike than the classes I had taken with Rita -- the type of food and the kitchen was different, the class was larger -- but the spirit was the same. I learned new skills and tricks, met lovely new people, and at the end of the class, sat back and savored all the sweets we'd whipped up (the milk chocolate ganache will forever hold a special place in my heart). In fact I was so inspired and excited about my class that I signed up for Carla Tomasi's bread class that same week (more on that here). But I digress! Putting the class aside and getting to the recipe -- sablé, if you're not familiar, are sort of France's answer to the Scottish shortbread cookie. They are crumbly and delicious and buttery and addictive, and naturally, since they're French, very elegant and understated (miles away from the far less subdued Funfetti Cookie, for example). That being said, sablé cookies may be French, but I'm not French, and therefore I didn't leave the chic sablé as is. Nope -- the American side of me decided to take the sablé to the next level with a little embellishment, and the Italian side of me thought that the best way to do this would be with an Italian classic, Nutella. Nutella, if you didn't know, has the same properties as bacon, cheese, and butter, or rather, tends to make most things its added to even better. The sablé is no exception -- here we have a swirl of dreamy, chocolate-y hazelnut filling sandwiched between two crisp, buttery, cocoa cookies, the bittersweet flavor of the chocolate countering the sweetness of the filling, and the crunch of the cookie contrasting beautifully with the smooth Nutella. These were heavenly, you guys (did you expect anything less from a chocolate-Nutella-sandwich-cookie?!) and if more cooking classes means more recipes like these, well, my cooking class kick has officially recommenced. Stay tuned...! 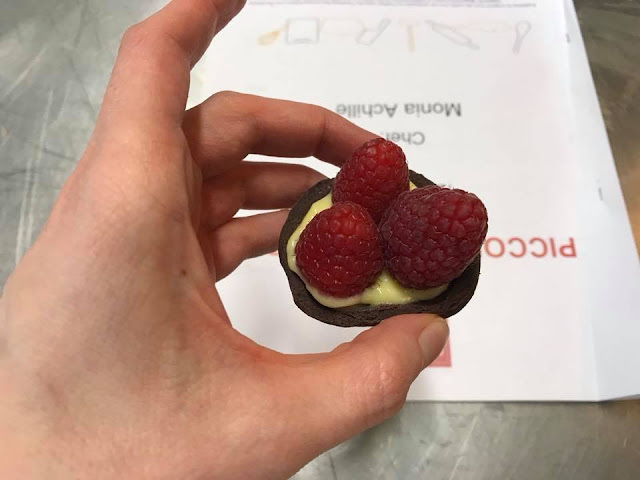 A couple of notes: This dough is quite versatile; feel free to leave the cookies plain if you just want sablè cookies, or you can use the dough to make a tart crust (see the photo of the chocolate tart and raspberry tartlet above). They could also be filled with dulce de leche and I might try and fill them soon with a mascarpone filling per the suggestion of a friend of mine. If you make a plain version of these, they would also be good plain dipped in semi-sweet or white chocolate. Finally, Monia was an excellent instructor -- I would highly recommend taking a course with Monia at Gambero Rosso (if you are an Italian speaker, though -- the courses are in Italian). Head to the Gambero Rosso site (www.gamberorosso.it) if you want to sign up. If you happen to be in Bologna and want to take a cooking class, you can contact Rita here at remmattioli@gmail.com. Note that she does classes both in English and Italian. Looking for other cookie recipes? A few more favorites: these Funfetti Cookies from last week, Brutti ma buoni, these White Chocolate, Almond, and Apricot Biscotti, these Brownie Cookies, these Brown Butter and Chocolate Chunk Cookies, these Gingerbread Cookies, these Oatmeal Chocolate Chip Cookies, these Dark Chocolate Coconut Macaroons, these Magical 4 Ingredient Peanut Butter Cookies, and these Peanut Butter Sandwich Cookies. Cookie cutter of your choosing - if you want to make these a round one is best. I used one with a diameter of 2-inches (5cm). Place the powdered sugar, flour, and salt in a large bowl and whisk to combine. Add the butter and using your fingers, work it into the dry mixture until it begins to look like buttery sand (fun linguistic facts: sablé means "sand" in French, and the verb for this action in Italian, I learned, is "sabbiare" -- "sabbia" means sand). Add in the cocoa powder and mix with a spoon until fully incorporated, then the egg and stir everything to combine well. Turn the dough out on to a very lightly floured work surface and knead it a few times until it comes together. Form a ball with the dough, then flatten it into a disk, and wrap it in plastic wrap. Refrigerate for at least 1 hour or until firm enough to roll out. Preheat the oven to 350 degrees Fahrenheit (170 degrees Celsius). Line a baking sheet with parchment paper and set aside. 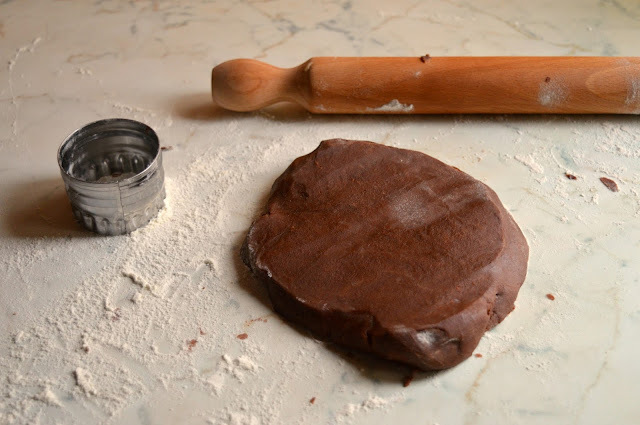 When you're ready to use the dough, place it again a very lightly floured work surface and roll it out until it is 1/4 of an inch thick for thicker cookies, or 1/8 of an inch for thinner, crisper ones (I made both). Using your cookie cutter, cut out your cookies, spacing them on the baking sheet evenly (they won't spread much). Bake for 8-10 minutes, or until set. Repeat with the remaining dough, putting together the scraps and rolling out again. Let the cookies cool completely. When the cookies are completely cooled, dollop a nice bit of Nutella (I'd say about a generous teaspoon) over half of the batch (about). 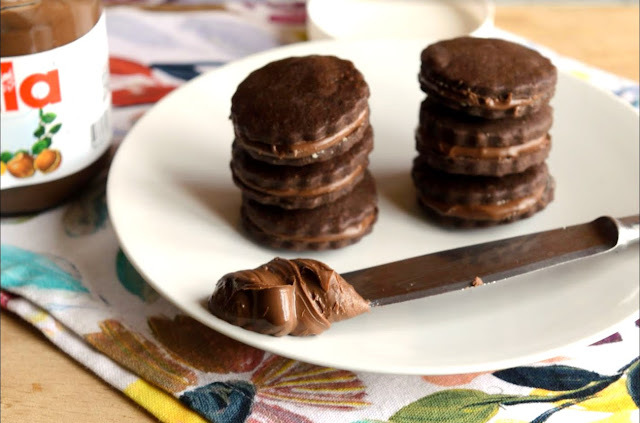 Top the Nutella filled cookies with another cookie, and enjoy. Makes 18 sandwich cookies (using a 2-inch cookie cutter). I can't wait to try these! I am going to make that tart too. Thank you for your beautiful blogs and wonderful recipes!! Love from Rhode Island!